Two Silly Sisters: Delicious gluten free pasta does exist! Growing up, homemade pasta was always a special treat saved for the weekends. I have fond memories standing around the kitchen table, watching my mum and aunty kneading the pasta dough, putting it through the pasta machine (which I always insisted in helping with!) and turning the delicate pasta sheets into little pillows of meat filled pasta… known as Ravioli. When I was diagnosed with Coeliac Disease, I thought my pasta making days were over! But making gluten free pasta is not as hard as you think. However, it is time consuming and a little patience is needed along the way. So sticking to tradition, I like to make pasta on the weekend, when I am most relaxed and have a little extra time up my sleeve. Why don’t you give it a go yourselves with our recipe below? 1. Combine the ricotta, parmesan, egg, nutmeg, salt and pepper in a bowl and mix well. Place in fridge until needed. 2. For the pasta dough, place the sifted GF flour onto a clean workbench and make a well in the centre of the flour. 3. Break the eggs into the well of the flour. Using a fork beat the eggs and slowly start adding the flour. Once the flour has been incorporated, knead the dough until it has a smooth surface. 4. Let the dough rest on workbench for at least half hour, covered with a plastic bowl. 5. After the dough has rested, cut into 2 equal parts. Place the dough you are not working with under the bowl so that it doesn’t dry out. 6. With a floured rolling pin and workbench, roll out one piece of the dough into a thin rectangular shape. Put to the side and repeat process with second piece of pasta, ensuring it is the same size and shape as the first piece. 7. Drop a tablespoon of the ricotta mixture at 6cm intervals along one side of each strip of dough. Brush around the filling with a little water then fold over the other side of dough to enclose filling. Use your fingers to press around the filling to seal and remove any air bubbles. 8. Use a scalloped-edged pastry cutter to cut around the parcels to form semi-circles. Let stand on a floured surface to dry. 9. Place the ravioli in a saucepan of salted boiling water and cook for 5 minutes. 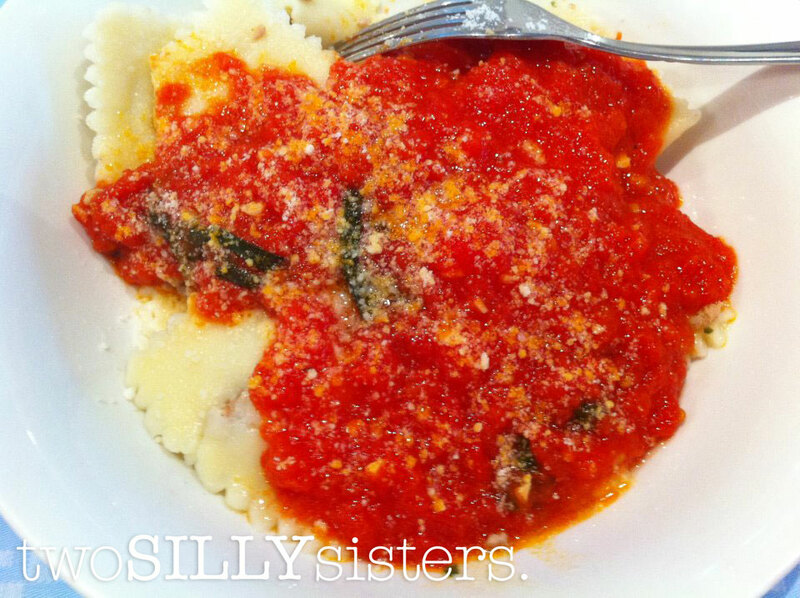 Use a slotted spoon to transfer ravioli to each plate. 10. Serve with pasta sauce of your choice. How would you store these, could you freeze them? Hi Peta, you can definitely freeze these ravioli. We usually divide them up into serving portions before storing them in plastic freezer bags. This makes them easy to grab for a quick meal without having to defrost & use the whole batch! Would this recipe work as spaghetti or fettucini instead of the ravioli?